New York Marriott Downtown is a luxurious hotel housed in a skyscraper of 38 floors located in the NYC's Financial District and close to most attractions of this beautiful and vibrant city. Just steps away from the Battery Park, Wall Street, the 9/11 Memorial and the shops and restaurants of Brookfield Place. 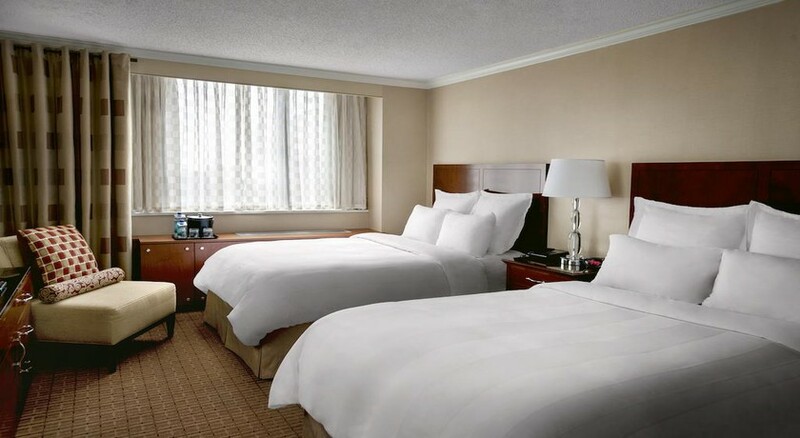 This property offering 406 immaculate rooms and suites with modern and plush guest amenities is a luxe retreat for those travelling to NYC for business and pleasure. Featuring a fitness centre, a helpful concierge service, a restaurant, a lounge and many more, the hotel is the perfect place to spend your New York City vacation. New York Marriott Downtown is located in NYC's Financial District, just a few steps from the Battery Park, Wall Street, the 9/11 Memorial and the shops and restaurants of Brookfield Place. Wall Street Subway Station just 900m, making it possible to explore the entire city with ease. This JFK International Airport is about 35km from the hotel. 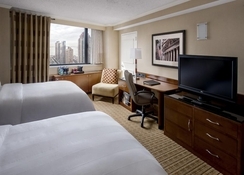 The New York Marriott Downtown offers 506 guestrooms spread over 38 floors. Offering lovely views of the busy Wall Street, Hudson River and downtown NYC, the rooms offer marble bathrooms and luxury bath amenities. 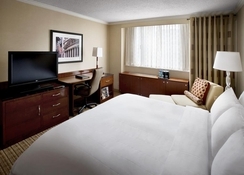 The non-smoking rooms are equipped with safes, air-conditioning, luxurious bedding and high-speed Wi-Fi Internet. 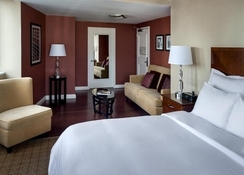 Guests have the option to upgrade to Concierge Level room to for better amenities and lounge access. The executive suites feature a massive 703 square feet of space and large windows, with a living space and marble bathroom with shower/tub combination. Theses soundproof accommodations may also feature connecting rooms, for some suites. The New York Marriott Downtown has a Bill's Bar & Burger, one of NYC's favourite snack joints along with shakes, fries and salads open for breakfast, lunch and dinner. The Bill’s West Side Bar is the place to sit down with a chilled cocktail in a great ambience after evening dawns. Guests can also ask about the hotel’s private dining options in NYC downtown. The New York Marriott Downtown offers mini golf and bowling, cycling and tennis off-site while maintaining a fully-equipped fitness centre for those who wish to stay active during their travel. Guests can walk out and witness the 9/11 memorial and the Freedom Tower next door. Bustling downtown Manhattan, Battery Park and Wall Street are just steps away for guests to explore. There are shops on site for groceries and essentials. Guests can avail a range of beauty services at the hotel.